As Americans end their Thanksgiving weekend, filled with news stories of economic gloom and doom and terror troubles around the world in India and other places, while there is good news from Iraq, it is a good time to remember past troubles and know that they were overcome with patience and hard work. 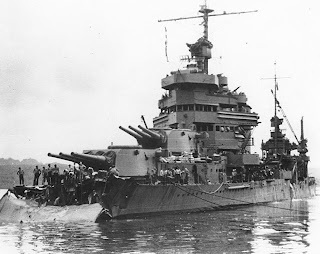 As it happens, November 30 is the 66th anniversary of the The Battle of Tassafaronga. "The battle of what?," you might ask. For some time after the Battle of Guadalcanal, the Japanese appeared to have abandoned their troops to slow but inevitable extinction. The unfailing indicator of their intentions--the amount of shipping in the Buin-Faisi area--fell rapidly after the middle of November, and remained low for a week or 10 days. Several other ships were, however, en route to the South Pacific. By 25 November, as the enemy's aggressive plans became evident, we had assembled a force adequate to counter the expected offensive. At Nandi in the Fijis lay the carrier Saratoga, the battleships North Carolina, Colorado, and Maryland, and the light cruiser San Juan. The heavy cruisers New Orleans, Northampton, and Pensacola, and the light cruiser Honolulu were stationed at Espiritu Santo. These last two, together with the heavy cruiser Minneapolis which arrived on the 27th, had come from Pearl Harbor. Here also on the 27th were the destroyers Drayton (which had accompanied the Minneapolis), Fletcher, Maury, and Perkins. What happened next is one of those cautionary tales about first reports, responsibility and a certain amount technical deficiency of the U.S. Navy. Japanese armed forces on Guadalcanal were short on everything. (1) They had no more than five artillery pieces, and could not afford to fire more than ten rounds a day (the less, the better), for fears of being left without ammunition to repulse attacks or support counter-attacks. Japan's only ships capable of lifting large boxes of ammunition or large weapons were the fast seaplane tenders Chitose, Chiyoda and Nisshin, all of which were capable of around 28 knots - a necessity to avoid being counter-attacked by Henderson-based planes during the voyage back up the Slot (and of course, the voyage down). But food, it was determined, was possible to be carried by destroyers, if indigenious methods could be devised. They were. In the future, destroyers would carry drums formerly housing oil, gasoline, and whatever could be shipped in drums. These would be filled with foodstuffs and medicine and whatever else would be needed, though enough air would be left to leave the drums afloat. They would be made watertight, chained together, and simply dropped overboard by destroyers stopping off the friendly shore. Then, the chain or tow would be brought on land by ship's boat, the drums would be towed on land, there opened by Japanese soldiers, dinner would be held and finally, the re-strengthened Army troops would sweep away the U.S. forces in an offensive set tentatively for 22nd January 1943. The first lift of these drums would be provided by the most outstanding destroyer leader the Japanese had, Rear-Admiral Tanaka Raizo, taking eight destroyers, six with some 440 drums total, from Japan's Shortland forward base to a point off Tassafaronga, beginning his voyage on November 30, arriving by midnight 30th, early hours 31st. For the garrison on Guadalcanal, such shipments of drums, if maintained at a rate of two every three days, could mean sustained rations. It could not build up reserves, and it could not by any means ship ammunitions, being too heavy to be moved in floating drums in any significant amounts. Radar aboard the flagship detected the convoy at eleven miles and the US task force turned to parallel the enemy. The Japanese sailed close to the coast where they could not be detected by several of the DD radars and out of effective torpedo range. While commanders discussed the situation, the convoy passed its closest point of approach and twenty torpedoes were finally fired as the distance lengthened. Star shells were fired before the torpedoes completed their runs. The Japanese replied with a barrage of their excellent, long range and accurate torpedoes at the American gun flashes. 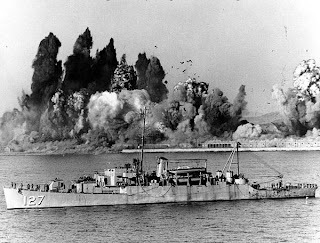 The scout destroyer reversed course firing incessantly, drawing the concentrated fire of the American ships while the convoy delivered their supplies, reversed course and launched a second salvo of torpedoes. Four cruisers took six torpedo hits and the remaining seven Japanese destroyers made good their escape. Heavy cruiser Northampton sank while Minneapolis, New Orleans, and Pensacola were badly damaged. Only the light cruiser, Honolulu, and the six destroyers escaped damage. 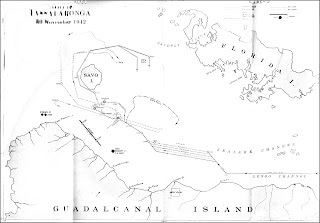 Under orders to intercept an enemy forece off Guadalcanal, a U.S. cruiser-destroyer task force moving on a northwesterly course off Tassafaronga (midway between Savo Island and Cape Esperance) encountered an enemy force of eight destroyers heading southwest on almost a parallel course. At 2320 hours American destroyers launched their torpedoes followed minutes later by gunfire from the cruisers. The Japanese responded with a massive torpedo attack. By midnight all firing ceased. 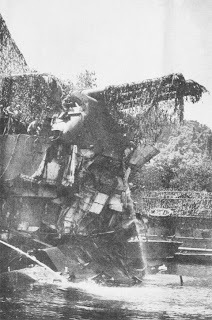 While all four of the U.S heavy cruisers were critically damaged, one of which sank the following day, neither the one light cruiser nor any of the six American destroyers were hit. The Japanese lost one destroyer sunk. None of the others was damaged. The Battle of Tassafaronga was a serious defeat for the Americans. Nevertheless, the damage control parties of the crippled U.S. cruisers merit the highest praise. All but the hardest hit cruiser were saved. After action reviews caused changes to be made in destroyer tactics and with continued air and Naval support, Guadalcanal was held, paving the way for the island hoppi ng campaign that ultimately resulted in victory. The U.S. learned not to underestimate the Japanese torpedo technology and learned to use radar more effectively. From a defeat...victory. And give a salute to the crews of the three heavily damaged cruisers that kept the sea out of their ships, allowing them to be repaired and brought back to fight another day. Tough guys - those 1942 sailors. On November 18, the Research and Analysis Wing (RAW) intercepted a satellite phone conversation, in which a so-far unidentified caller notified his handlers that he was heading for Mumbai along with a certain cargo. Mumbai Police investigators have determined that the call was made from a satellite phone that was eventually found abandoned on the Porbandar-based fishing boat Kuber, hijacked by the terrorists mid-ocean, most likely on November 19. The satellite phone also contains records of several other calls to Lashkar handlers in Pakistan. Government sources said the RAW warning sparked a full-scale hunt for the merchant ship on which the terrorists had sailed from Karachi. 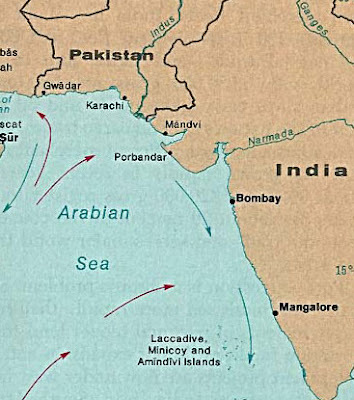 The hunt was led by the Indian Navy and the Coast Guard. India’s coastal defence forces used global positioning system coordinates from the intercepted call to locate the general area in which the ship was located. Based on the testimony of arrested Lashkar terrorist Ajmal Amir Kamal, investigators believe the terrorists hijacked the Kuber in order to avoid detection after they saw Indian patrols closing in on the area. Kamal, the sources said, has told investigators that some of the terrorists tied red ceremonial threads on their wrists to appear like Indian fishermen. Meanwhile, Mumbai Police sources said, the continuing interrogation of arrested Lashkar terrorist Ajmal Amir Kamal had allowed them to put together a coherent account of the mechanics of the assault. Kamal has claimed that the Lashkar assault team, which trained in boat-handling tactics at the Mangla Dam reservoir on the border between Pakistan’s Punjab province and Pakistan-administered Kashmir, was trained to locate their targets on a high-resolution satellite map. The bodies of five fishermen suspected to be crew members of fishing trawler 'Kuber' that was hijacked by militants involved in Mumbai attacks have been found, officials sources said here. The militants killed four members of the crew and threw their bodies into the water soon after taking control of the vehicle but kept the captain alive so that he could help them in navigation until reaching Mumbai's shores where they slit his throat, the sources said. "The officials have recovered four bodies of fishermen suspected to be crew of 'Kuber' from high seas, while the body of its captain was found hand from the boat seized by Mumbai Coast Guard," they added. The captain's hands were tied behind his back. "Terrorists departed from some locations in Pakistan by vessel 'M V Alpha'. We don't know the exact locations from where they started their journey from that country but the route of the trawler started from Pakistan," Customs officials involved in the investigations said. To avoid the possibility of being caught by Indian marine security agencies, the terrorist hijacked the fishing trawler 'Kuber' probably near Jakhau, and instructed the Captain to cruise towards Mumbai, they added. The four onboard crew members of 'Kuber' were killed on way and thrown into water, the custom officials said. The fishing trawler owned by one Hiralal Masani and his brother Vinod Masani, had sailed from Porbander for fishing expidition on November 14, though the departure time of 'Kuber' in custom records was registred as November 13, the officials said. Someone at the UN Satellite office went a lot of trouble to produce the pretty picture shown below (click on it to make it bigger). It comes from here (pdf). UPDATE: My comment - If ship traffic moved its routing to be in or closer to the Maritime Security Patrol Area, you would expect that the pirates would have to move into or closer to the MSPA in order to find targets for their operations. In other words, if the ship tracks moved north, away from the Somali coast, I would expect the pirates to move north along with the traffic, just like fishermen move to where the fish are biting. 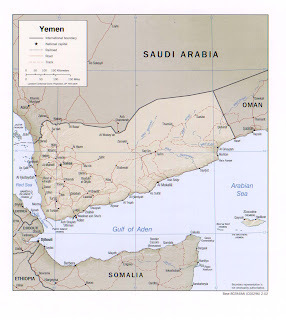 UPDATE2: Further, I would think the major shipping route from the strait at Bab El Mandeb would tend toward hugging the coast of Yemen anyway, as that provides the shorter route to, say, the Strait of Hormuz. "That's where the ships are." 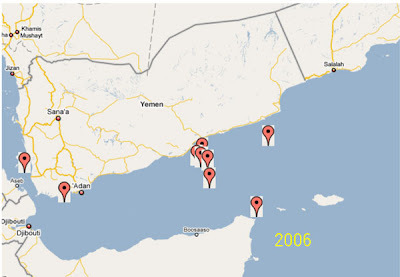 The implementation of the MSPA has had a dramatic influence on pirate activity in the Gulf of Aden. As this map illustrates, the spatial distribution of reported pirate attacks has contracted spatially in pursuit of transit vessels travelling through MSPA. There are several measurements of this change. The mean distance between reported attacks has fallen from 30.5km for events before MSPA to 24.6km after (from 26 Aug. -21 Nov). The standard deviational ellipse of attacks (a measure of event distribution) before the MSPA narrowed considerably after the MSPA along the north-south axis. Further, the mean center of attacks has shifted to the west by approximately 200km. The overall shift has thus been of a concentration of activity along the MSPA, towards the Yemeni coast and to the west. There appears to be a lull in piracy activity: no new hijackings have been reported/can be confirmed since MV DELIGHT 18 Nov. Recent press reporting of Yemeni vessel hijacked [NB E1- see here] cannot be confirmed by independent sources and is being investigated. Most recent confirmed incidents were 2 approaches and one attack, all of which occurred in the Gulf of Aden during 23-24 Nov (As shown on slide) On 18 Nov Thai FV EKWATANAVA 5 was engaged and sunk by Indian Naval vessel TABAR. At the time of the engagement EKWATANAVA5 was under the control of pirates who probably intended to use her as a mother ship. 14 vessels remain hijacked comprising 12 merchant ships 1 fishing vessel and tug boat Yenegoa Ocean. The current slide displays last known position of hijacked vessels. The total number of commercial vessels (including one tug)hijacked in Somali waters now stands at 14; over 200 merchant seamen are held by pirates. The use of mother-ships seems to be on the rise, and potentially, vessels are hijacked with the sole intention of using them as such. * Approaches / attacks conducted from 2-3 small speedboats with 3-5 armed persons each. The number of boats involved in each incident seems to be increasing. Left off the NATO and UN lists is a report of a captured chemical tanker. 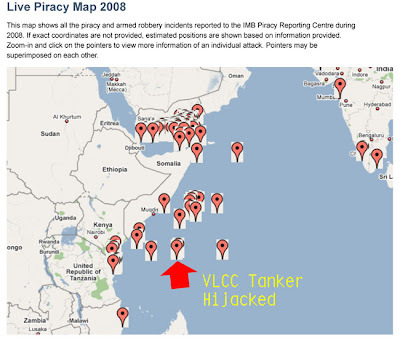 Finally, a screen capture of the "Live Piracy Map" available here, zoomed in for a closer look at Somalia and its surrounding waters, I added the red arrow and label to show where the Saudi VLCC was taken. You might note there have been other attacks in the same area. You might further consider that, while the Somali pirates historically have gone after ships with low freeboard (space between water and the first open deck), pirates in the Strait of Malacca have long been boarding vessels like tankers with higher freeboard. It's a matter of technique. Police spokesman Mohamed Samura says four of the eight pirates were killed early Wednesday in a clash with the Sierra Leone navy. Two were shot and two drowned. The other pirates were arrested. Armed Somali pirates have hijacked a Liberian-flagged chemical tanker in the pirate-infested Gulf of Aden, a regional maritime official confirmed on Friday. Andrew Mwangura, East Africa's coordinator of the Seafarers Assistance Program (SAP), said the seized vessel has 30 crew members, mostly Indians onboard. "The pirates seized the Liberian flagged chemical tanker in the Gulf of Aden with 30 crew members mostly Indians. There are three Indonesians, about 25 Indians and the remaining could be British," Mwangura told Xinhua by telephone. According to this, three British secuity gaurds jumped overboard and were rescued by helicopter. UPDATE: More on the capture and the performance of the security team, which apparently used fire hose, LRAD and other tools but were overwhelmed by RPGs and gunfire here. This post is stuck on top until November 29 to allow for you to make a contribution to Valour-IT. Newer posts appear immediately below this one. As I grow older I am more and more thankful for this great country that provides us with so much opportunity. 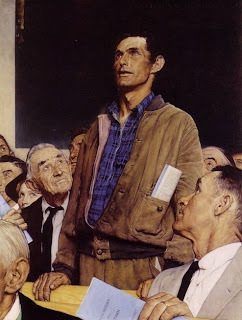 Most of all I am thankful for the greatest freedom we possess, the freedom of free speech where each of us can toss our ideas out into the world where they can be accepted, rejected or ignored. It is a freedom that needs constant protection and I am thankful for the long line of defenders that have kept it alive. In keeping with that thought, please help some of wounded defenders of freedom by donating to Valour-IT. Every cent raised for Project Valour-IT goes directly to the purchase and shipment of laptops and other technology for severely wounded service members. As of November 2008, Valour-IT has distributed over 2700 laptops to severely wounded Soldiers, Sailors, Airmen and Marines across the country, and is now expanding its mission to include other technology that supports physical and psychological recovery. Valour-IT accepts donations in any amount to support our mission, but also offers a sponsorship option for laptops. An individual or organization may sponsor a wounded soldier by completely funding the cost of a laptop and continuing to provide that soldier with personal support and encouragement throughout recovery. This has proved to be an excellent project for churches, groups of coworkers or friends, and members of community organizations such Boy Scouts. Originally Valour-IT provided the voice-controlled software that accompanies the laptops, but now works closely with the Department of Defense Computer/electronic Accommodations Program (CAP): CAP supplies the adaptive software and Valour-IT provides the laptop. In addition, DoD caseworkers serve as Valour-IT’s “eyes and ears” at several medical centers, identifying patients in need of laptops and other technological support for their recovery. 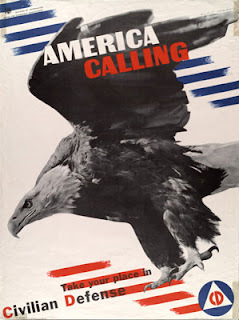 If you want to support the Coast Guard, Army, Air Force or the Marines, go here. Six Frigates about the earliest days of the U.S. Navy. A Most Fortunate Ship about "Old Ironsides." Two Ocean War about the U.S. Navy in World War II. You've got until the 29th of November to bid. Please help our wounded troops. Fred Fry put up on Monday his Maritme Monday 137 at gCaptain.com. It's got enough marine related links in it that you will be able to work off that turkey and stuffing, pumpkin pie and pecan pies, and whatever else is on the table for Thanksgiving while reading them all. Nothing says "turkey day" like Fred's linkage to Kennebec Captain's coverage of the "reality" show Whale Wars. John Donovan has a guest writer post about his view of Somali piracy here. Lot of bloodthirsty people out there who are not Somali pirates (who generally treat their hostages well because it's good for business to keep the merchandise in good shape. Your opinion may vary as mine does from day to day. Pinch links to a happy time. The example of Somali piracy is terrifying in that it has broadened the scope of the possible - previously this occurred to no one. The threat stemming from pirates is no less great than the threat from terrorists. Terrorists are, after all, fanatics, while piracy is a business involving nothing personal. Far more enthusiasts could join a profitable criminal outfit than give up their lives for an idea. the Coast Guard, officials said. A CG spokesman said that searches were being carried out on board the ship but declined to elaborate. 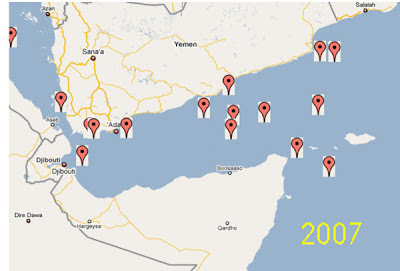 recent action by the Navy against the sea bandits in the Gulf of Aden. 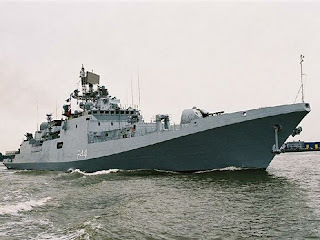 Asked whether there can be any connection between the pirates and the attacks in Mumbai, Vice Admiral Sunil K Damle, Flag Officer Commanding-in-Chief, Southern Naval Command, said such a thing cannot be ruled out. "I cannot say but I will not rule it out. I cannot say whether there is connection or not. All I am saying is that we very strongly suspect such a thing can happen," he told reporters on board the INS Tir. "It is a fact that our action against the Somali pirates in the recent past has got the Indian Navy into focus particularly in that area", he said, adding this also brought in a danger...Indian Navy being targeted by these people also in addition to the terrorists," he said. "These bad elements unfortunately have a fair amount of illegal money at their disposal. Even if Somali pirates were not taking direct action against us, there is every possibility of them pumping in the money into such organisations which are capable of taking terrorist action against us", he said. UPDATE: As usual,the more information received, the better the analysis - it seems now that is very likely the terrorists arrived from the sea, but very unlikely they are directly connected to the pirates of Somalia. A radio discussion from 25 November 08:Yo Ho Ho and a Tanker of Oil: The Perils of Modern Piracy on "To the Point" on KCRW, Santa Monica. Guest hosted by Sara Terry. About 40 minutes of Q&A about the Somali pirates. Downloadable in MP3 format or listen on line. “We have countries that give us information about the ships in the sea, if there are commercial ships sailing our way,” he told the Arabic newspaper. Asked how the pirates followed these ships, he replied that they had “collaborators” who provided information on vessel movements. He referred to informants in several countries including Yemen, Eritrea, Kenya, Sri Lanka, Dubai and South Africa. “We have radars and know every ship’s location,” he added. "Over the past two months we have been able to film four pirate attacks on merchant ships," says Commander Michael Potthoff (42), who commands the 65-men German Orion contingent in Djibouti. "Eight attacks were prevented because of our presence." According to the naval officer, the onboard radar equipment can "detect a soccer ball at a distance of 20 km. Ships that carry ladders are suspicious for us. After all, fishermen do not need ladders. It is also suspicious when many people are on deck of a small boat and disappear quickly as soon as we turn up." Wicharn told reporters that the Ekawat Nava 5 was headed from Oman to Yemen to deliver fishing equipment when it was set upon by pirates off the Horn of Africa. The pirates were seizing control of the ship when the Tabar moved in, he said. Wicharn said he learned the fate of his vessel from a Cambodian crew member who survived the gunfire and drifted in the ocean for six days before he was plucked to safety by a passing ship. The sailor was recovering in a hospital in Yemen, he said. 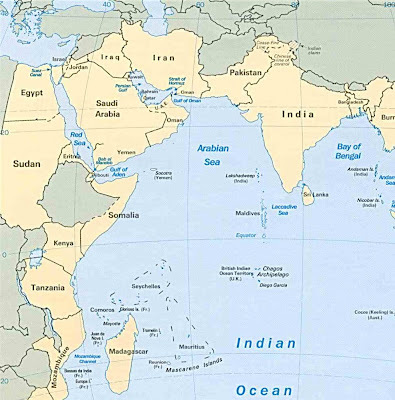 The current series of pirate attacks is just a small indication of the growing disorder in this part of the world, to which India cannot be a silent witness. The sad feature of all this, is the absence of any maritime leadership to control the situation with force, firmness and speed. The multi-lateral mechanism to achieve this aim is traditionally the UN and India’s delayed participation in the Somalia patrol is on account of the hoary old MEA (NB E1: India's Ministry of External Affairs) belief that all initiatives in the world must come from the UN — a body not known for reacting fast enough to prevent tragedy the world over. As usual the pirates have actually sought sympathy by making excuses, such as we can’t help it, we have no other means of income or, we want only money, we won’t sell any military cargoes, or even worse we are protesting by being pirates since the world neglects us. These protests are clearly ridiculous, because the whole area is just as poor, but only Somalia resorts to piracy. The pirate attacks began almost four years ago, but increased in intensity when the world failed to respond and pirates began to get away with huge amounts of ransom money. The ‘high life’ that the pirates lived attracted the envy of all the young, unemployed youth into becoming pirates too. . . If the Russians go old school on the Somali pirates, it will probably work. The Somalis are vicious and clever, but not stupid. Somalis and Russians speak the same language of violence, and the Russians carry a bigger stick. The world will complain, then enjoy the benefits of a piracy free Somali coast. And the probable deaths of a few hostages? Collateral damage? Piracy, of course, is hardly the only form of barbarism at work today: There are the suicide bombers on Israeli buses, the stonings of Iranian women, and so on. But piracy is certainly the most primordial of them, and our collective inability to deal with it says much about how far we've regressed in the pursuit of what is mistakenly thought of as a more humane policy. A society that erases the memory of how it overcame barbarism in the past inevitably loses sight of the meaning of civilization, and the means of sustaining it. UPDATE3: As I meant to add before my power went out - I am not in agreement with Strategy Page. Such brute force as they project may work in a short term operation. But the Russians and their special forces are not going to hang around forever off Somalia and they will not make the effort to go after the real power behind the pirates. 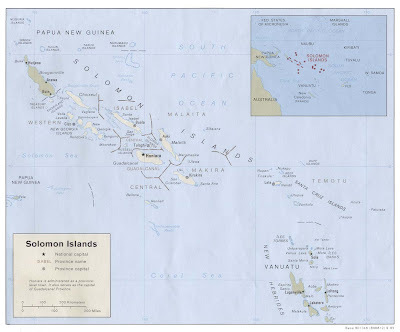 As with most intelligent insurgent forces, the pirates may withdraw from the coasts temporarily, wait for the navies of the world to go home (which they will do) and then start up again. 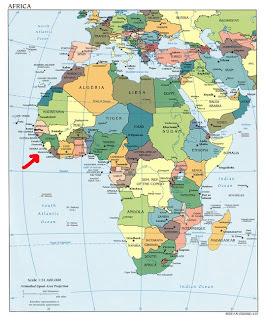 As I have said before, the solution to the Somali pirate problem can be contained from the sea, but solved only on the land. Even killing every man found in some Somali pirate port will not change that equation, though it would bring universal condemnation, which even the Russians would have to listen to. A hammer is a useful tool, but it is not right for every job. Note that the Somali pirates are pretty clever in making sure they take their captured ships into Somali waters and off the high seas. Pirates have seized another cargo ship off the coast of Somalia, the 10th vessel to be captured in 17 days. The Yemeni ship Adina was last heard of a week ago, after it had been out to sea for a week. Yemen's interior Ministry announced last night the ship had been hijacked in the Arabian Sea. The ship's cargo and other details were not immediately known. A group of tanker owners has proposed a naval blockade off the coast of Somalia as a way of stopping pirate attacks. Peter Swift, head of the International Association of Independent Tanker Owners (Intertanko), said the UN could co-ordinate naval patrols in the area. He acknowledged that a blockade would not be easy. Mr Swift said many tanker owners are considering a detour around South Africa to avoid pirates, and that this would raise costs by 30%. He said continuing attacks would have a major impact on world trade, but that Intertanko opposed arming merchant ships to defend against pirates. "The other option is perhaps putting a blockade around Somalia and introducing the idea of intercepting vessels leaving Somalia rather than to try to protect the whole of the Gulf of Aden," he said. A blockade along Somalia's coastline "is not easy but some intervention there may be effective," he said. 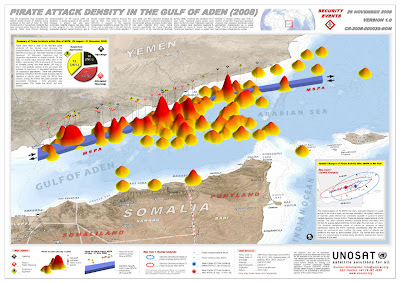 A "ring of steel" to seal off known pirate ports might viable if there are enough ships to do the job and the governments providing those ships don't mind paying for an extended commitment off Somalia. Without an invasion of Somalia to quell the pirates, there are not many good options to contain the pirates other than escorting ships and patrolling known danger areas. While they are there, perhaps a blockading force could help the Somalis with the alleged problems they face with illegal fishing and dumping by foreign ships. It is the nature of humankind, I suppose, that great military tales of heroism often begin with poor assumptions made by higher commands that end up being paid for with the blood of those with their boots on the ground. The high command assumed that the Germans couldn't mount a winter offensive led to the Battle of the Bulge and the everlasting fame of the troops at Bastogne. The Charge of the Light Brigade is immortalized in poetry and art . . . and then there are the Marines and Soldiers of the Chosin Reservoir - forever known as the "Chosin Few." Famed for their "attack in a different direction" as they fought their way back to the beach for recovery, the Marines were placed in a difficult position by an overly aggressive high command and an underestimation of a potential enemies intentions and capabilities. That they escaped at all is a feat of arms that was a miracle and a tribute to the Marine spirit as well as to the support they received from the Navy and Air Force. 1. The Korean peninsula was once home to one Korean nation established in the 6th Century. However, due to wars between Japan and Russia and Japan and China, the Japanese ended up occupying Korea at the start of World War II. At the end of the second world war, the Soviet Union occupied Korea down to the 38th parallel and the Allies occupied the area south of the 38th parallel. Korea was now a divided country. Thereafter followed a period of restructuring which ultimate led to a communist dictatorship in the north and an anti-communist dictatorship in the south. Both of these governments wanted t o unite the whole of Korea under its own banner. On June 25, 1950, the North Korean army invaded South Korea to force unification of the country. The South Korean, or Republic of Korea (ROK) forces resisted but the invasion. The U.S. had a substantial force in the area, especially in occupied Japan and elements of that force were thrust into action. 2. After its initial success, the North Korean (Democratic People's Republic of Korea or DPRK) forces dominated all but a small area of the southeastern portion of South Korea, an arc generally around the South Korean port of Pusan. This toe hold, hastily established was able to hold off the DPRK forces as they hit logistics problems much of it caused by U.S. air power bombing roads and bridges that would have been used for resupply. Inside the Pusan Perimeter, a rapid mobilization brought fresh troops, heavy armor and artillery. Soon the force swelled to outnumber the DPRK troops and counter-offensive operations started to expand the perimeter. 3. General MacArthur, recognizing the DPRK had serious logistics issues, developed a plan to sever DPRK main supply routes by a thrust "behind enemy lines" at the ROK port of Inchon. In September 1950, the Inchon invasion, one of the great military feats succeeded and the main body of the DPRK army in the south was effectively cut off from supplies. UN forces spread out from the Pusan perimeter, killing and capturing a substantial number of North Korean soldiers, though abut 30,000 managed to escape into North Korea. 4. The UN forces did not stop at the 38th parallel. In October 1950, UN forces pursued parallel pushes up the east and west coast of North Korea, pushing the remnants of the DPRK army before them. The Chinese, concerned that this thrust northward might not end at the Yalu River (the dividing line between Korea and China) but lacking direct communications with Washington, sent a message through the Indian government that the Chinese would intervene if the UN forces crossed the 38th parallel. To some extent the attacks up the coasts became a "race to the Yalu" by UN commanders (U.S. generals Walker (8th Army, west) and Almond (X Corps, east) to see who could reach that goal first. In the face of light resistance, some measures to secure flanks and prepare defenses seem to have been skipped. These practices, especially the march and bivouac discipline, explain why United Nations aerial observation never discovered the CCF deployment into Korea. The Chinese Communist Forces moved 300,000 men into position in October and November and none of them was ever discovered by the U.N. Command prior to actual contact. While the planes were overhead searching for possible Chinese movement into Korea, the Chinese, perfectly camouflaged, lay hidden below. The aerial observers did not see them nor did the aerial photographs reveal their presence. By November 24, from left to right on line, Eighth Army consisted of: I Corps, with the 24th Division, the British 27th Brigade, and the ROK 1st Division; IX Corps, with the 2nd and 25th Divisions and the Turkish Brigade; and ROK II Corps, with their 6th, 7th and 8th Divisions. 1st Cav was in reserve. In all, about 135,000 troops. In the east, X Corps had about 100,000 men: the 1st Marine Division (22,000), and the Army's 7th Division, with the under-strength 3d Infantry Division in reserve at Wonsan; and the ROK I Corps, consisting of the 3rd and Capital Divisions, operating along the east coast. Rough terrain characterized the area in northeast Korea assigned to the X Corps... Even the coastal plain hardly deserved that name; the only level or semi-level land there consisted of isolated pockets extending inland generally for a distance of from three to five miles. These were separated from each other by hill spurs that came down to the sea. The Wonsan-Hamhung pocket is by far the largest of these northeast coast semi-level areas. *** At the ports of Wonsan and Hungnam ice is unusual, and when it occurs it is so thin as to be unimportant. Back of the coastal strip lies the northern Taebaek Range with its steep slopes and narrow, twisting valleys. The peaks in the highest parts of the range reach an altitude of 6,000 feet or more. In the interior part of the northern Taebaeks the winter temperatures often reach 20° to 30° below zero. Snow in October and November is normally infrequent, and in December not usually heavy enough to form deep, permanent drifts. But rivers in the Taebaek Range usually freeze over by mid-December. Beginning forty air miles northward from Hamhung and extending another forty miles north in the heart of the Taebaek Range lies the Changjin Reservoir. Fifteen air miles east of it lies the smaller Pujon (Fusen)  Reservoir. 7. Although their presence was reported on several occasions due to captured Chinese soldiers (see here), the presence of Chinese forces in great numbers seems to have been discounted at the higher levels of command. However, in defiance of the low estimates of Chinese strength, in late November 1950, the Chinese sprang to the attack. On the night of November 25-26, the CCF (Communist Chinese Forces) struck. Following their evaluations of the initial fighting, they struck the ROK II Corps. By morning, they had torn an 80-mile penetration of our lines, exposing the entire Eighth Army right flank, in particular the 2nd Division. The Turkish Brigade was virtually thrown in the gap, and destroyed. By evening, November 27, the reserves of the 1st Cav and the British Brigade were thrown in as well ... not to press on to the Yalu, but to assist in the withdrawal of all Eighth Army forces. For Eighth Army, the results had been catastrophic. On November 29, Walker ordered a general withdrawal, starting the longest retreat in U.S. Army history. Within 6 weeks, Eighth Army fell back 275 miles, abandoning huge amounts of material and suffering almost 10,000 casualties. Retreating across the Chongchon River, then below the 38th parallel, pausing momentarily at the frozen Imjin, then abandoning Seoul. The Chinese advance finally ran out of logistical steam 45 miles south of Seoul at Pyontaek, and UN forces formed a fairly stable defense base. Yudam-ni was a small town sitting in a long, narrow north-south valley bisected by the Main Supply Road (MSR). The valley of Yudam-ni gives off into 5 smaller valleys, each separated from the next by a high, hilly ridge complex. North-northeast lies the Reservoir, and to the south is Toktong pass, a bottleneck reached by a steep, narrow section of the one-lane MSR. 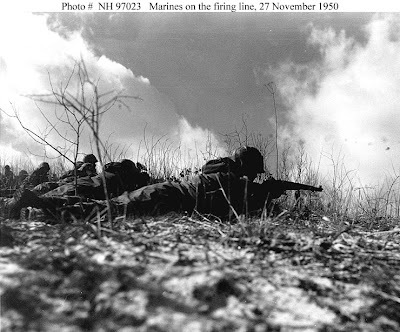 On November 27, there were nearly 4 Marine rifle battalions and the bulk of 3 artillery battalions positioned at Yudam-ni, about 7,000 men. While staging for their assault over the next 40 miles to reach Eighth Army, fate had brought most of the 5th and 7th Marine regiments together, instead of isolating them on different sides of the Reservoir. Moreover, strong elements of Divisional headquarters were in Hagaru-ri, 14 miles back. Through prudent and skeptical organization, all main fighting elements of the entire 1st Marine Division were in mutually supportive positions within 35 miles of each other along the lonely, single track MSR, instead of isolated beads on a string, as X Corps orders might well have made them. 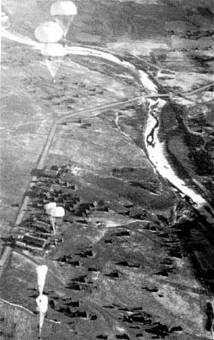 Moreover OP Smith, 1st Marine Division Commanding General, had initiated the construction of an airfield at Hagaru-ri, and ammunition and supply dumps within supporting range of all Division units. General Smith was not cautious, he was careful. His foresight saved the Division, or rather made it possible for the Division to save itself. General Almond's over-confident aggression almost lost the division anyway, and did cost X Corps the 32nd Infantry. 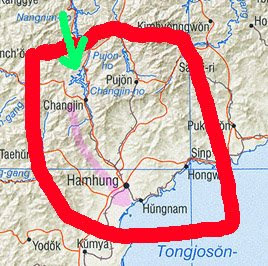 Uninformed of the CCF attack which was smashing Eighth Army, the 5th and 7th Marines' orders were to secure the surrounding ridges of Yu Dam Ni, and attack NW toward Kanggye in the heart of north central Korea. Tactically, they were to move over the 40 miles of Taebaek mountains to secure Eighth Army's right flank, the ROK II Corps. Also unknown to the two forward Marine Regiments, they were at that time almost surrounded by 3 CCF divisions, about 30,000 men, about the same number that earlier drove the whole Eighth Army back to the Chongchon River. Plus, 7 CCF divisions were moving behind them. The entire CCF 9th Army Group was moving to cut the MSR in sections, to divide and then crush our famed 1st Marine Division. Carefully, methodically, knowing that whatever High Command said they had already met and defeated one CCF division and were certain there were more around, the Marines began their assault. By the next day, the entire 25 miles of MSR between Yudam-ni, Hagaru-ri and Koto-ri was enfiladed by the Chinese, and the Marines at those isolated towns were under vicious and unrelenting attack by almost overwhelming numbers of veteran CCF infantry. On the Reservoir's east coast, a full Chinese division, expecting to find an isolated 5th Marine Regiment, found instead less than 3000 men of the 7th division's 31st RCT, and were crucifying them. With no reinforcement possible from the embattled Marine battalion at Hagaru-ri, Lt. Col Don Carlos Faith (Task Force Faith) and the 1053 officers and men of 1st Battalion 32 Infantry fought bravely against overwhelming odds, but died with the rest of 31RCT. Today, the remains of the unknown men who fell there still lie unmarked in that barren wasteland. An additional 385 men were able bodied men. Able, meaning that they could walk and hold a weapon. The 385 men from the 31st RCT then fought with the 7th Marines as both the Army and Marines participated in the breakout from Hagaru-ri to the coast at Hungham. The 31st RCT then lost more men as the casualties increased during the breakout. On November 26, 1950, the order was given to make a fighting withdrawal to the south, towards the seaside city of Hungnam. Ten Chinese divisions, along with North Korean soldiers, formed a gauntlet that the retreating men would knowingly have to cope with. 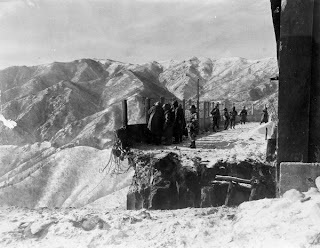 An American unit from the Seventh Infantry was isolated on the eastern side of the Chosin reservoir and eventually all but wiped out by a Chinese division. Major General O. P. Smith, commanding the First Marines, was ordered to lead the breakout to the south to escape the trap. The incredible cold, including temperatures as low as 48 degrees below zero, made the march and fighting unbearable. Smith was quoted thusly when asked if he was retreating. "Retreat, Hell! We're attacking in a different direction." As they withdrew, the Marines were indeed attacking, or under attack by the swarming Chinese. The UN forces enjoyed air supremacy; their bombers flew hundreds of missions a day against the Chinese. Over 4,000 wounded were evacuated out of the Chosin Reservoir when the weather cleared sufficiently, with some 500 reinforcements flown in. The intense cold would take its toll on both sides as the conflict wore on. As they escaped, the Marines and soldiers obliterated a full seven divisions of Chinese warriors as they tried to stop them. Survivors of this action recalled how the Chinese would attack. They came in waves, with the first wave coming down upon the Marines the only one that actually had guns. When they were killed, the second wave would advance and grab up the weapons and fight on. The third wave came and took the guns from the dying second wave to battle with. Some soldiers swore that a fourth wave of Chinese would remain behind and machine gun any of their own troops that thought of retreating. The weather made it almost impossible for the UN army to be re-supplied, until it cleared in early December. Ammunition and rations were dropped from the air, but the fight was far from over. The Marines and soldiers still had to fight through to the port of Hungnam to evacuate by ship. The Marines took their dead with them, sometimes having to lash them to the tops and fenders of their vehicles. The bodies were frozen solid; the grisly decision often was made to literally break off dead soldiers' arms so they would fit on or in transporting vehicles. Wounded men, because of the frigid temperatures, actually saw their blood freeze where they were hit. Many Marines froze to death, while several thousands of men suffered frostbite. Smith: Every four hours we sent in a report of what was going on, but apparently they were stunned; they just couldn't make up their minds that the Chinese had attacked in force, you see. They just had to re-orient their thinking. It took them two days before we actually were told to withdraw to Hagaru-ri and advance to the coast - that took them two days to figure out. The 5th and 7th fought their way into Hagaru-ri. Our plan for getting out of there was to have the 5th completely capture all the high ground just east of Hagaru-ri - we called it the East Ridge. the Chinese were looking right down at us, and we had never had enough troops to chase them off of there. We held on to one end of the ridge, that's all. So the plan was to have the 5th go up and capture that ridge, because until it was captured the people on the ridge could fire down on the road going to Koto-ri, and we had to have the whole ridge before we could move a large outfit down the road to Koto-ri. Once Murray captured the ridge, then Litzenberg was to start moving down the road. We had divided up the column into two components - one under Litzenberg and one under Murray - the vehicles and everything else. We had Train No. 1 and Train No. 2; we had a very complete operation order. There was no word of withdrawal in there at all. That was an attack order because we were attacking, and we gave them objectives to capture enroute to Koto-ri, and had an appendix on what to do about destruction. And we destroyed very little. We had to destroy a few rations, and we stripped a few deadlined trucks of their spare parts. The rest of the stuff came out all right. Q: Knowing of you, your reputation and your career and what you've done during the war, this business of writing an attack order - was that a grandstand play - was this the logical move at this time? Smith: Sure, you couldn't withdraw when you're surrounded. I've tried to explain that a "retreat hell" business to people. You can't retreat or withdraw when you are surrounded. The only thing you can do is break out, and when you break out, that's an attack. And the only fellow who understood that was S. L. A. Marshall - he understood it thoroughly. He wrote up a top secret report on the 1st Division breakout. A very fine document. We knew that the bridge over the penstocks just below Koto-ri had been blown when we were still at Hagaru-ri, and Partridge was planning on what to do about it. He flew in a light plane down opposite the bridge - he flew back and forth and he darn near froze to death trying to take some notes, trying to make an estimate of what he needed to replace the blown bridge. The bridge had been blown a couple of times, and the final blowing of it left a gap of about 30 feet, but there was absolutely no way to bypass that bridge, there was this steep slope and these four tremendous pipes - penstocks - that came down the mountainside, and they had this one way concrete bridge across the penstocks. There was no place you could build a bypass. It was just like that. So we knew we had to replace the bridge. He went down and then he talked to me about it. Smith: Oh no, this was LtCol. Patridge of the Marine Corps. He commanded the Engineer Battalion. he was kind of a grouchy guy. He came up to me and told me about this plan. He'd talked to the Air force, we had communication with Hungnam by two-way radio telephone links. He said what he want to do was to drop Treadway bridge sections from the air at Koto-ri and put in a Treadway bridge over this gap. He admitted that the Air Force had never dropped Treadway bridge sections. Each section weighed 2,500 pounds. But the Air Force was willing to make some test drops and see what they could do. I asked him a few questions. I said, "Now look, do you know if it'll work? Have you tried it out?" He said he'd made arrangements for a test drop. I said, "suppose some of the sections are damaged in dropping? Have you got any provisions for that?" Yes, he said he'd ordered double the number required. I said, "If all the Treadway bridge stuff fails, are you prepared to put in a trestle bridge?" (We would have lost our tanks of course.) He said, yes, he knew where he could get the timber. I could see that he was mad by that time by my questioning. The next thing was to get the bridge site which was held by the Chinese. Murrary had no difficulty getting to the high ground up above it, but in the snow Litzenberg had pretty slow going trying to get the high ground on either side of the road just south of Koto-ri. He finally got moving going to his second objective down the road. And we started out this bridge train behind him, because we wanted to get that stuff to the bridge site as soon as possible. There were two trucks, I think. They followed close behind Litzenberg's CP, and then mortar fire began to come down and Litzenberg got worried that the mortar fire would hit these darn trucks, so he told Partidge to go on back up the road out of range of the mortar fire and he sent for him later. So Partridge went backup the hill. It was getting dark and he saw what looked like a flat field off to the side of the road and there were some Marine tanks around there, so he figure that was a good place to stop. It wasn't Koto-ri, but those tanks would give him protection. He backed on to this flat place - it was ice, and his trucks crashed. He got one truck out with no difficulty. The other truck was damaged. They stayed there until Litzenberg captured the bridge site. Then they went on down, and it only took Partridge 3 - 1/2 hours to install that bridge. A Treadway bridge is nothing but two metal treads, but you have to have abutments to tie into, and he had some difficulty building up some abutments there. This bridge would take 50-ton tanks - we had 50-ton tanks - and we needed that bridge to get our tanks out. But he got the bridge completed. Before he got it completed we started the convoy. By that ti me we had 1,400 vehicles in that convoy - artillery, tanks, everything - and we'd started out from Hagaru-ri with 1,000 vehicles. We picked up 400 vehicles at Koto-ri. So by the time he got the bridge completed the head of the convoy was at the bridge. Night had come by then, and Partridge had stationed engineers with flashlights to guide these people across the bridge. . . 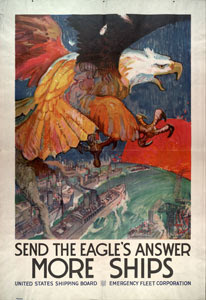 Along the way, the division and supporting aircraft from the lst Marine Aircraft Wing and carriers of the Navy's Task Force 77 would inflict an estimated 37,500 enemy casualties (including 25,000 dead), leaving the 9th Army Group unable to fight again until the following spring, after it received an estimated 60,000 replacements. Throughout the lst Marine Division's fighting withdrawal, Marine aircraft and the Air Force's Combat Cargo Command conducted a critical aerial resupply and medical evacuation. 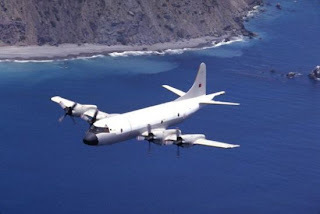 Over 4,000 wounded Marines and Soldiers were evacuated by Air Force aircraft from the besieged airstrip at Hagaru-ri, near the southern tip of the reservoir. At Hungnam, while the U.S. Army's 3rd Infantry Division secured the perimeter, the Navy's Task Force 90 -- including attached merchant ships of the Military Sea Transportation Service (now the Military Sealift Command) -- conducted one of the largest and most orderly amphibious withdrawals in history, redeploying 105,000 Allied troops and evacuating close to 100,000 North Korean refugees who voted with their feet against communism. More on the evacuation,"an amphibious operation in reverse" here (photo caption and credit: Hungnam Evacuation, December 1950. 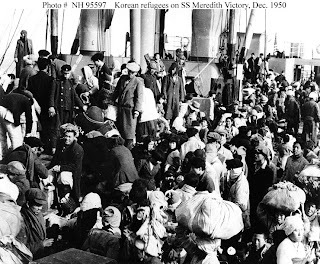 Some of the 14,000 Korean refugees crowded on board the SS Meredith Victory in December 1950, as she transported them from Hungnam to South Korea. Courtesy of the U.S. Naval Institute, Annapolis, Maryland.U.S. Naval Historical Center Photograph.) After the evacuation was complete, the port was destroyed. 1st Marine Division C.O. General O.P. Smith and his battle-hardened Regimental Commanders had deliberately slowed their advance into the Taebecks in spite of demands for haste from X Corps commander Army General Almond. In their view, any advance must always be based on adequate preparation and support. This procedure subsequently allowed the 1st Marine Division to coordinate its infantry, artillery, armor and air units during the fight-out, even preparing a crude air-field at Hagaru-ri for logistical support. Among other activities, this airfield enabled evacuation of over 4,000 wounded and frost-bitten Marines and Soldiers during Dec 2-5. This included more than 1500 7th Division troops, with all 31st RCT survivors unfit for duty. Without the stubborn professional approach of the experienced Marine command staff and its veteran leadership at all fighting levels, the tragedy east of Chosin would have been a much more general disaster too terrible to contemplate. As one veteran said, "Thank God for the Marines." CG 65 is the first U.S. NAVY warship named in commemoration of the First Marine Division’s breakout from a Chinese Communist encirclement at the Chosin Reservoir during the Korean War in the bitter winter of 1950. Historians term the Battle of the Chosin Reservoir as the most savage battle of modern warfare. It is compared to Tarawa, the bloodiest battle of World War II. "Weapons Company, in line with Headquarters and Service Company, 2nd Battalion, 7th Marines, trying to contact the temporarily cut off Fox Company in a glancing engagement to permit the 5th and 7th Marines to withdraw from the Yudam-ni area. Nov. 27, 1950. "Quoted from original picture caption, released by Headquarters, U.S. Marine Corps, on 22 December 1950.Yudam-ni, at the western extremity of the Chosin Reservoir, was the scene of early combat in the campaign, as Chinese forces attacked the two Marine regiments there. The Marines subsequently had to fight their way back to Hagaru along roads surrounded by the enemy. Official U.S. Marine Corps Photograph, from the "All Hands" collection at the Naval Historical Center. During the day on 28 November, General Almond and his aide, 1st Lt. Alexander Haig, helicoptered into the perimeter of TF MacLean. Despite all the evidence of massive Chinese intervention, Almond exhorted the soldiers to begin the offensive. "We’re still attacking," he told the soldiers, "and we’re going all the way to the Yalu." The corps commander then flew back to Hagaru-ri, convinced that TF MacLean was strong enough to begin its attack and deal with whatever "remnants" of CCF forces were in their way. That evening the Chinese remnants struck again. The CCF 80th Division hit the dispersed U.S. units with waves of infantry. Despite the reassuring presence of tracked antiaircraft weapons (40-mm. killing machines), the sub-zero cold and the constant Chinese attacks began to take their toll. The fighting was often hand to hand. Convinced now that launching any kind of attack on the twenty-ninth was futile, Colonel MacLean abruptly ordered a pullback to form a more consolidated defense. That accomplished, he proposed waiting for the arrival of his missing third battalion before resuming any offensive operations. However, during the withdrawal operations his troops came under renewed enemy attack, and in the confusion MacLean was captured by the Chinese. With no hope of rescuing his commander, Colonel Faith took command of the task force. Colonel MacLean in fact died of wounds four days after his capture. The epic struggle of Task Force MacLean—now called Task Force Faith—was drawing to a close. Its separated tank company, augmented by a pickup force of headquarters company soldiers and clerks, attempted twice to relieve the beleaguered force. However, the tanks foundered on the icy roads, and the attacks were further hindered by misdirected air strikes. The tanks withdrew into the safety of Hagaru-ri. Faith, unaware of this attempted rescue because of faulty communications, was running short of ammunition and had over four hundred wounded on his hands. General Smith, commander of the 1st Marine Division, was given operational control of the cut-off Army unit, but apparently had his hands full withdrawing his marines in an orderly fashion into Hagaru-ri. The 7th Division commander, Maj. Gen. David G. Barr, flew into the perimeter of TF Faith on the thirtieth, but had only bad news for Colonel Faith. The Marines could provide little more than air support. Continued Chinese attacks during the night of the thirtieth and into the morning of 1 December left TF Faith in a dangerous situation with no help in sight. Chinese assaults had almost destroyed the perimeter that night, and the number of wounded went up to nearly six hundred, virtually one-fourth of the entire formation. Believing that one more Chinese attack would destroy his force, Faith decided to withdraw and run the Chinese gauntlet down the frozen road along the east side of the reservoir in hopes of reaching the marines at Hagaru-ri. On the morning of 1 December the exhausted men of TF Faith formed into a column with the wounded piled into about thirty overcrowded trucks. Taking a while to get organized, the column began to pull out in the early afternoon just as their Marine air cover arrived. Tragically, the lead plane dropped its napalm short, and the thick, jellied gasoline exploded near the head of the column, badly burning over a dozen soldiers. Many of the men ran for cover, destroying what little order the column had left. Colonel Faith rallied the men and got them moving again, but near-panic had set in and the men began to gather in leaderless groups. The CCF, noting the withdrawal, began to pour in fire from the high ground to the east of the column. As it advanced, the column encountered a destroyed bridge on the road. Bypassing the bridge was possible, but only one vehicle at a time could be winched up the steep slope on the other side. The CCF clustered along the column, directing fire into the exposed trucks. Farther south, the column was stopped by a Chinese roadblock near Hill 1221. Some brave soldiers under the command of a few officers stormed up the slopes and, despite severe casualties, managed to take most of the hill, gaining valuable time for the column. It was getting dark, and the lights of Hagaru-ri could be seen in the distance over the ice-covered reservoir. However, the Chinese roadblock stood between the column and safety. Desperately, Colonel Faith gathered a few men and charged the Chinese defenses. Seizing the position, the American soldiers managed to disperse the enemy, but Faith was mortally wounded. Although his men managed to prop him up on the hood of his jeep and the convoy began moving again, the retreating force began to give up hope. Despite the desperate attempts of the few remaining leaders, the convoy began to come apart. Just miles from safety, the column hit another blown bridge. The few unwounded men began moving out over the ice, thick enough for foot travel but not for vehicles, leaving the stranded convoy behind. By dark Task Force Faith thus ceased to exist. As the CCF fire intensified with heavy machine guns and grenades, the remaining able soldiers abandoned their trucks and fled to Hagaru-ri over the ice. Colonel Faith, later awarded the Medal of Honor posthumously, remained behind with his men to die in the cold. 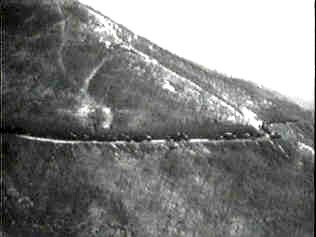 All during the night of 1–2 December, shattered remnant of Task Force Faith trickled into the Marine positions at Hagaru-ri. A few were rescued by Marine jeeps racing out over the ice to pick up dazed, frostbitten survivors. Some 319 Americans were rescued in this manner by individual marines. Many of the worst wounded were airlifted to safety. Of the 2,500 men of Task Force Faith, 1,000 were killed, wounded, captured, or left to die of wounds. After the air evacuation, about 500 7th Infantry Division soldiers were left to accompany the 1st Marine Division as it began its withdrawal from Hagaru-ri to the port of Hungnam, fifty miles southeast, and evacuation by sea. The men of Task Force Faith did not die in vain. They had virtually destroyed an entire Chinese division and prevented any possible attack south by the Chinese for four critical days. If they had not been able to hold out as long as they had, the 80th Division might have hit the 1st Marine Division perimeter at Hagaru-ri in force before the 5th and 7th Marines could have withdrawn. Those units might then have faced dug-in Chinese roadblocks in their rear instead of a safe perimeter and a reasonably open road to the south. The entire fate of X Corps may well have been different, if not for the bravery and stubborn defense of the area east of the Chosin Reservoir by the men of Task Force Faith. Pirates and the law: What law? Somalia Pirates: New south Somalia group?